In the history of Advaita after Sri Sankara Bhagavatpada, it is a unique and rare event that is being commemorated by the publication of this Volume-the Diamond Jubilee of the ascension to the Sri Kamakoti Pitha by His Holiness Jagadguru Sri Chandrasekharendra Sarasvati, Sri Sankaracharya of Kanchi. For sixty years the Acharya has adorned the Holy Seat founded by Sri Sankara Bhagavatpada, making its lustre spread far and wide and bringing solace to innumerable seekers all the world over. The present Volume is a collective offering made to the Jagadguru by His devotees, as a humble token of their ineffable gratitude, veneration, and love, on the auspicious occasion of the Diamond Jubilee. Advaita, which is the Plenary Experience, is not a system among the systems of philosophy or a cult among the cults of religion. It has been taught by great preceptors from time immemorial as the culmination and goal of all philosophical schools and religious persuasions. The Advaita tradition traces its inspiration to God Himself - as Sriman-Narayana or as Sada-Siva. The supreme Lord revealed the wisdom of Advaita to Brahma, the Creator, who in turn imparted it to Vasishtha. This wisdom was handed down at first as vamsa-parampara, i.e. as from father to son, in succession. With Suka and Gaudapada commenced the sishya-parampara, i.e. the line of succession from preceptor to disciple. Sankara, an avatara of Siva, was the greatest consolidator of Advaita: his penetrating and lucid commentaries on the three prasthanas, viz. the Upanishads, the Bhagavad-gita, and the Brahma-sutra, have been acclaimed as masterpieces of Vedantic literature. The teachers of Advaita who came after him have expounded the Upanishadic teaching in numerous works. 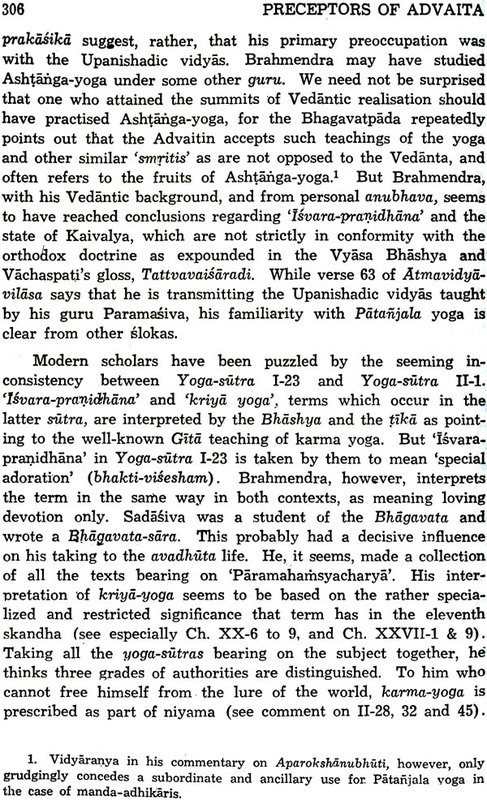 In the present Volume, there are articles contributed by various scholars on the Preceptors of Advaita belonging to the three periods into which the history of Advaita falls: (1) that of pre-Sankara teachers, beginning with Vasishtha, (2) that of Sankara and his immediate disciples, and (3) that of post-Sankara exponents of Advaita. The first fifty-six articles cover sixty Preceptors of Advaita: it will be seen that not only philosophers but also poets, literary writers, and exponents in some of the regional languages have been included here. Articles 57, 58, and 59 are devoted to Sankarite Institutions. Kamakshi and Kamakoti, and the Kamakoti Pitha, respectively. The sixtieth article presents a brief life-sketch of His Holiness Jagadguru Sri Chandrasekharendra Sarasvati, the Sage of Kanchi, the Diamond Jubilee of whose Pitharohana this Volume commemorates. In the last article, the sixty-first, are given English translations of two of His Holiness's discourses-(i) On Advaita, and (ii) On the Significance of Sankara Jayanti. We are grateful to all those who have, with great joy and profound devotion, helped to make the publication of this Volume possible: to the scholars who have contributed articles; to Dr. N. Veezhinathan who translated into English such of those articles which were originally written in Samskrit or Tamil, and who attended to the many details of publication; to Dr. T. P. Ramachandran who assisted in reading the proofs; to Sri T. Sadasivam, Editor, "Kalki", for help and advice in regard to the illustrations and the cover-design; to Sri Sridhar of "Ananda Vikatan" for supplying photographs of His Holiness; to the G. S. Press for the excellent printing; to the Government of Andhra Pradesh for a generous grant-in-aid. May this reverential offering to His Holiness serve, in however small a measure, the cause of Advaita-which is the cause of universal Spiritual Peace-so dear to His heart!